The following report is a fictitious account of how a young person in America could become a suicide bomber for an Islamic extremist group. 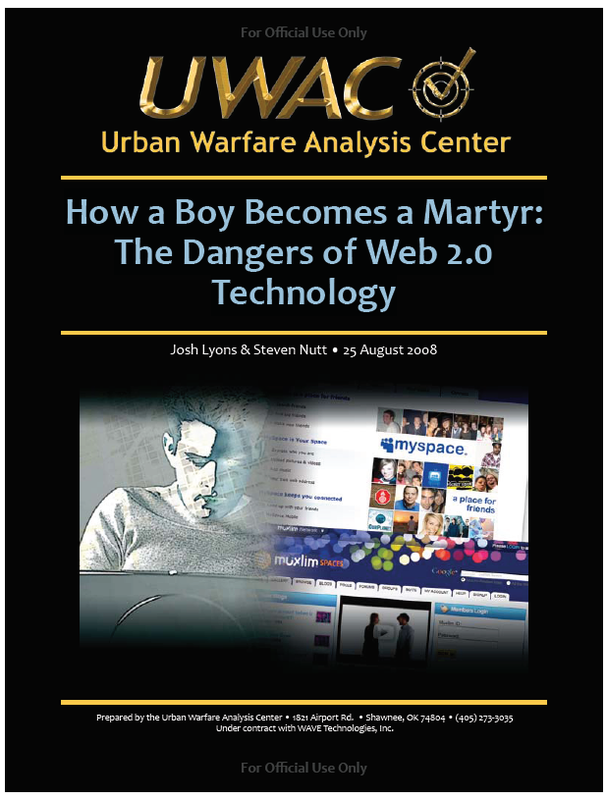 It is the fifth in a series of reports on Web 2.0 technology and future urban warfare. All references to people, groups, and products are intended for illustrative purposes only. As such, the authors do not suggest that any of the products or organizations listed condone or support extremist activities. he finds solace in friendships made online through social networking sites. Pete and Jafar are identified as friends on MySpace, they can view each other’s private pages. new Islamic friends from around the world. acquaintances at school are unaware of this burgeoning development in his life. also prays with millions of other avatars in what proves to be a formative experience for him. hatred for Israel and solidifies his desire for jihad. welcomes this new relationship. He frequently skips school to spend time with Abdul. has been trying for many years. Pete feels like a champion. He finally won at something. selected: a packed house at an upcoming home game. The team’s management has posted a video tour of its newly renovated arena on its website. arena inside Second Life provided by a group of rabid fans boasting about the new facilities. Jafar organizes a meeting with several key colleagues at a private island inside Second Life. discuss details of the attack. guard patrols, and police video surveillance – all available online. inside Second Life. Pete is welcomed as a champion by what seems like thousands of Muslims. cannot be friends any longer should Pete abort the mission. everyone within a 30-foot radius. Chaos ensues as spectators run for the exits. were heroes of exceptional character.